A fun enough adventure, though there's a bit of a slow start and some mythical magic. North, Ombric, and young Katherine are searching for other magical relics they can use against Pitch the Nightmare King next time he rears his black head. Meanwhile, another Guardian is watching, cut off from the world...with the knowledge that he'll be called upon to help save it. The Guardians are a dedicated group of people and willing to risk dangers to do what's right. North, Ombric, and Katherine display a deep friendship and care for each other. Despite their differences, North and Bunnymund pull together when it matters most. Nightlight is a brave fellow as well and performs his job as best as he can. Ombric is a wizard of Atlantean origin with knowledge of a great many spells. He had devised a number of protective magical barriers - including the Spirit of the Forest who had turned some men into statues - around the town of Santoff Claussen. He can communicate with owls telepathically and via a glass plate; he's also capable of astral transportation. Pitch used to be one of the good guys until some villains escaped his charge and "devoured his soul," making him just as dark as they. This transformation is first mentioned, then witnessed. Prior to this adventure, he'd learned some "spells of enslavement" by which he is able to turn living beings into porcelain. He'd hidden inside a spider and possessed a robot. He is said to have locked a character in his heart. Children and heroes alike remember that "magic's real power is in believing". They chant, "I believe" a couple times. Lunar Lamas are "holy men". One of them taught Katherine the art of making magic sketchbooks that could bring her pictures to life and connect her to her readers. A lama is seen meditating. They also own a clock that records every second of time and allows users to time-travel into the past. North has a magical sword. The heroes find that they can mind-meld. One character's past involves being mysteriously saved from death by another's voice. Not exactly "spiritual", but Bunnymund claims that Earth was egg-shaped "zillions of years ago", but he'd rounded it to maintain a safe orbit around the sun and made a couple continents while he was at it. One character hurls a dagger at Pitch and pierces his armor. The dagger is then used against its master. Pitch runs his sword through a character. Pitch isn't all that gentle with the children he kidnaps and is especially threatening to Nightlight. North and Bunnymund are formidable warriors, using their weapons on Pitch and his army of shadowy Fearlings. 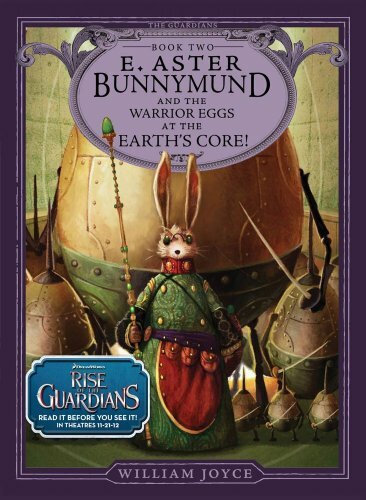 Ombric and Bunnymund's egg-warriors join the fray. This is a fun read with diverse characters and themes of friendship and courage, though I found the going slow at the beginning. Not to mention that the title character isn't properly introduced until about halfway through the book. There's a good deal of magic (though not of a dark nature) and of belief therein, which may put off some readers. Note: "The Guardians of Childhood" novels are best read in chronological order as they build on each other; "Nicholas St. North" precedes this story.